Gear and I are off to Italy Monday to work with the T-Mobile professional cycling team. We will be meeting with the riders, physicians, trainers and staff and will show them all aspects of the TrainingPeaks and CyclingPeaks systems. A lot of cool data will be flowing your way this season as we work with T-Mobile men and womens programs. We hope to be able to share some great race and training data from the team as the season gets under way. This upcoming week should be a great experience. 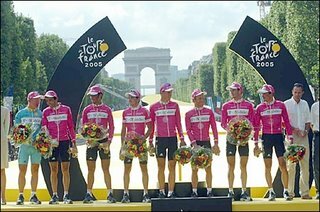 I know the time we get with the team in 2007 will help take TrainingPeaks to a higher level as we start to learn from other professional riders and doctors what metrics they like to track and analyze. There should be a great wealth of ideas and information flowing back and forth between the team and TrainingPeaks, and as always we realize our software is never going to be complete. The is just the next step in our evolution. Training Peaks Powered by SRM becomes the Official Training Software of T-Mobile Team. Boulder, Colorado (October, 2006) - Training Peaks, LLC, the leading provider of online training and analysis software for endurance athletes and coaches, has been selected as the exclusive software provider of the T-Mobile Team . The T-Mobile Team is one of the leading professional cycling teams in the world, competing at the highest level of the Cycling Pro Tour, including the Tour de France. All T-Mobile Team coaches, physiologists, nutritionists and athletes will be equipped with Training Peaks and CyclingPeaks WKO+ software. Combined with SRM power meters, athletes will directly download their training and race data into CyclingPeaks WKO+ desktop software and then synch their files up to web accounts at TrainingPeaks.com. By incorporating both Training Peaks desktop and web services, T-Mobile team doctors and coaches will have access to rider data 24hrs a day, from any computer world wide. Training Peaks functionality will allow the T-Mobile Team Management to monitor, analyze and plan all aspects of a rider's training program. "We are very pleased to be a part of the T-Mobile team for 2007. By using Training Peaks products the T-Mobile management and the riders have a one stop shop for collecting and analyzing data. T-Mobile Directors will also be able to easily manage travel schedules and race programs all within the Training Peaks platform. We believe we have the perfect solution for T-Mobile to stay on top of team performance," said Training Peaks business development director Dirk Friel. Nutrition is also an important aspect of performing at the world class level and the T-Mobile riders will be able to monitor their diet and communicate that data to the team dietition within the same software platform as their cycling data. All Training Peaks accounts include a robust nutritional logging platform; connected to one of the largest nutrition databases for easy monitoring. "T-Mobile Team improves the work and communication between riders, coaches, sport scientists and team doctors to set a new standard in training. The combination of Training Peaks & SRM is the perfect tool to collect and manage the data and will help to reach a higher quality of training and performance." says team doctor Lothar Heinrich. This kind of proactive attitude toward monitoring, analyzing and planning all athlete data not only helps the team increase performance, it also helps the team stay in front of the doping issues plaguing cycling today. As reported by T-Mobile, their top priority is to support and enable athletes to perform better without breaking rules or risking their health. Training Peaks is also the official coaching software provider to USA Cycling and USA Triathlon. Self-Coached athletes can use the same software as the T-Mobile Team by visiting http://www.trainingpeaks.com/ for a 7-day free trial. Training Peaks, LLC develops and maintains http://www.trainingpeaks.com/ The Endurance Operating System for Athletes, Coaches and Active Lifestyle Participants.